This evening I plan to explore the Shinkyogoku shopping arcade, a huge shopping complex at the corner of Kawaramachi and Shijo streets and just one bus stop away from the hotel. What better way to spend a rainy drizzly evening than to go souvenir shopping under covered walkways! Standing in the drizzle at the Kawaramachi Matsubara bus stop waiting for either the number 4 or the number 17. Within a block of stepping off the bus I’ve found a couple high end stores on the street that sell traditional Japanese crafts. Its started raining so I’m glad I decided to shop under covered walkways. All of Kyoto is sporting those Y500 umbrellas you can buy at any conbini. Here is the Teramachi entrance to the Shinkyogoku shopping arcade and whoa is this place HUGE and features everything from both high-end jewelry and designer clothes down to 100 Yen stores. They say the three-street complex is rivaled in size only by Tokyo’s Nakamise shopping arcade in Asakusa. Not to be outdone by Osaka’s iconic mechanical crab, here’s a restaurant with a giant mechanical crab, so cute! The arcade map shows several shrines/temples in the arcade and I’m looking at a very traditional Buddhist temple now. Right in the arcade! The arcade and street shops also features several other shrines: Starbucks, so I should have access to WiFi if I’m lucky. And speaking of religious figures, here’s a KFC with the obligatory statue of The Colonel in period Japanese costuming. 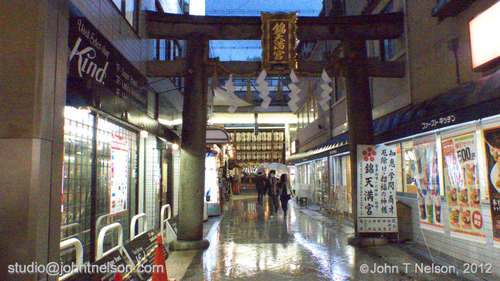 By coming to Shinkyogoku I handily dodged the bullet of getting caught in the rain while pursuing temple and cultural sites. Ironically, the rain is now providing me with photo opportunities galore and while I’m under shelter in the arcade.